As full as life is these days, I didn’t want to miss the opportunity to share a special treat that a MOM might like. Besides, I promised a mom I would. 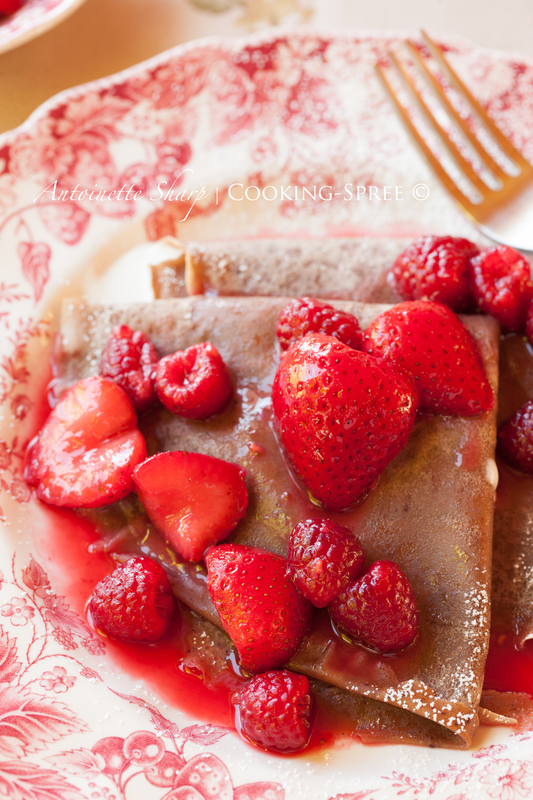 I’ve shared another crêpe recipe with you previously (“plain,” yet not-so-plain, and simply wonderful) – partly because of its versatility, savory or sweet, it remains our favorite. Don’t misunderstand – today’s crêpe is no slouch! And it steps in to fill the cockles of a chocolate-lover’s heart…it might even be the one to make a Mom or Grandma swoon….if you aim for that sort of thing. With a plateful of warm crêpes of chocolate, you’ll be faced with choices…What to pool inside? What to dribble over? ♥ Maybe you’d like to macerate your berries in melted raspberry sorbet first – you’ll know what to do with them from there…! NOTE: Keep in mind that it’s best to prepare these at the very least one hour ahead of cooking. Two hours is better. Overnight, or a full day ahead, is great! This allows the flour molecules to become fully hydrated and the crêpes to become their tenderest. Into a small to medium saucepan place the butter, chocolate and milk and gently heat, stirring occasionally, until the chocolate has melted. Remove from heat. Allow to sit for at least one hour. See NOTE above. Check the consistency of your batter. It should be like a thin cream…add small amounts of milk, mixing thoroughly, until desired consistency is reached. When it’s time to cook your crêpes, a non-stick skillet (8 – 10″) will work best. But any skillet of this size will work…they will just require a spraying or a buttering/oiling of the pan from time to time. Crêpes are better if they’re drier, but don’t let this stand in your way of a treat! Heat the oven to 150°F (65°C) and place a plate inside. Place your skillet over medium high and allow it to come to temperature. Depending on the size of your pan, you’ll only need 1½ to a scant 3 Tablespoons of batter per crêpe. Once your pan has reached temperature, raise it off the heat and drop in the batter, tilting the pan in a circular motion so that it coats the bottom of the pan evenly. Any holes can be filled with a touch of additional batter. When the underside is cooked and the topside is mostly dried (only about 1 minute!) lift one edge with a butter knife, or a skinny spatula (or even your fingers) and flip it to finish the crêpe – 30 seconds or so. Place them on the heated plate in the oven (covered with foil) as you prepare the others, or serve them as they come out of the pan, as you prefer. These crêpes will freeze well if prepared ahead. Simply place parchment paper or waxed paper squares between them, and then placed in a freezer bag. Allow them to come to room temperature and then gently reheat them in a warm oven. Then fill and prepare as you like. Whisk together. Add about a tablespoon per crêpe before folding or rolling. 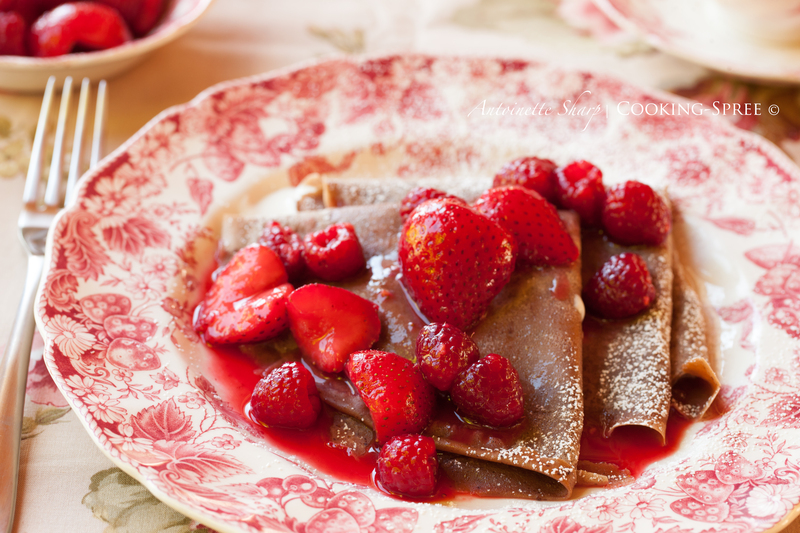 This chocolate crêpe recipe comes from Laura Calder, in French Taste, a lovely little cookbook. How delicious isn’t this … your are some talent lady .. and you make it so fantastic on a plate. If I had a restaurant I would talk you into … working for me, because I can’t do omelets or pancakes – .. and I don’t work with yeast … your china even match. This is total eye-candy. I have tried for years …. I can’t …. and I’m a chef – I think it’s a mental thing … I have a block somewhere about pancakes. I’m world champion on souffles. Yes, Viveka, I know all about mental blocks! It’s not that you can’t make them, it’s that your mind has told you you can’t and you believed your lying mind! (Believe me, I know all about that sort of thing!) : ) I still maintain, if we were cooking side by side, you’d soon be flipping crepes onto your own pretty plate! You nailed … it’s so true – my mind has made it’s mind up. I’m sure it will be able to do it … with you as my mentor. Our berry season is just beginning and I can envision fresh strawberries tucked inside your scrumptious Chocolate Crepes! A marvelous recipe! I am making these for me this weekend! That’s the way, Sawsan! Enjoy! That looks really delicious! And the plate ware is really lovely! 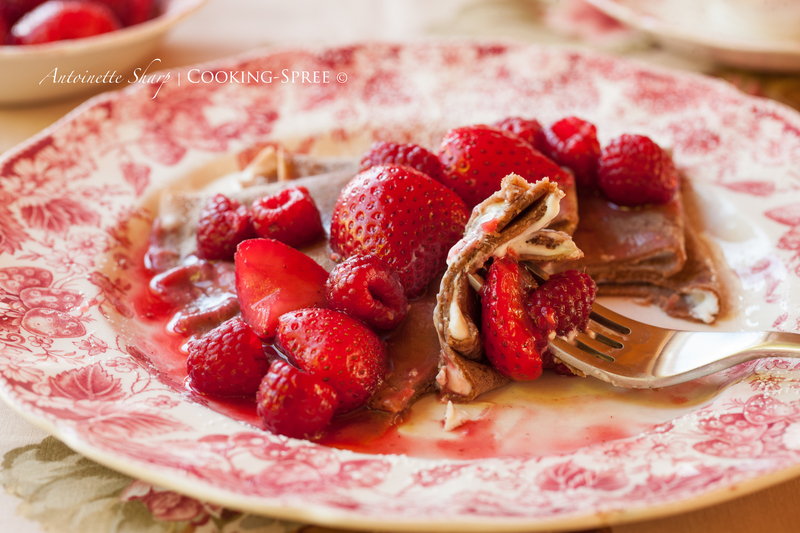 Your dreams of oregon raspberries and whipped cream with chocolate crepes are nearly on your table mama…hang on! Much love back! Such beautiful photos. Adore the plate! And, of course, the crêpes look grand, too. What can I say? These look beautiful, tasty, maybe even healthy and I’m sure so satisfying. Lovely photos Antoinette. I love that detailed red too it’s perfect for a special lady. Ah, thank you much “bunny”! What a beautiful photograph of your delicious crêpes! Mama, so beautiful! These photos are positively lovely, and berries and chocolate…what could be better?! You’ve always made such wonderful crepes. Lucky us. Oh gosh ! I hope that I am not too late to ask for a plate of these as I feel that they may have all been eaten by your fellow bloggers. This is a recipe to really wet the appetite and thanks so much for sharing Spree. Can anything be better than crepes? Not in my mind. So delicate, so delicious. Thank you for sharing this recipe, Spree. I just know it will be placed in some of the other ones you treated us to, like the amazing chick pea soup. These look so good — love your presentation! They look very vry delicious!! These look divine… even 3 weeks later! I like the all milk crepe recipe. And all your options with the cinnamon scented whipped cream screaming at me. How about a Mexican chocolate crepe! These look so beautiful with those pretty strawberries on top! I just brought home some peaches and I’ll bet they would be good on crepes, too. I’ve never tried my hand at making these and it’s on my to do list. I think chocolate ones would be perfect to start with! and I’d like that very much Shimon! : ) that would have been the kind thing to do! I DESPERATELY want these. 🙂 Can you post some? 🙂 Beautiful images too..
Thats what i would like for my breakfast tomorrow!